The deaths of a pilot and three parachutists whose plane lost power and crashed in Devon were accidental, an inquest has found. 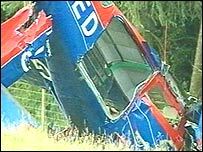 The Cessna, run by a parachuting school, crashed in June 2004. Pilot Paul Norman, from Wiltshire, Richard Smith and his daughter Claire, 17, from Devon, died in the crash. Top Devon parachutist Mike Wills shielded a tandem jumper and later died from his injuries. The verdict was recorded at County Hall in Exeter. The inquest heard the Cessna had five parachutists and the pilot on board when it took off. The single-engine Cessna 206 crashed seven minutes after take off at Dunkerswell airfield. Two people survived. The inquest heard the Cessna had enough height for three solo parachutists to jump and land safely but it was too low for two people to jump in tandem. Royal Marine Major Wills, 44, from Cove, near Tiverton, who had 5,900 logged jumps to his name, was due to jump in tandem with schoolboy Daniel Greening, who was 16 at the time of the crash. Mr Wills survived the crash but died later at the Royal Devon and Exeter Hospital. Daniel, from Kingsteignton, Devon, was seriously injured but survived. He told police Major Wills saved his life by positioning himself next to the plane's metalwork and lessening the impact on him. Another parachutist, Dan Bachelor, then 23, from Taunton in Somerset also survived. The inquest heard how Mr Batchelor remembered the aircraft engine cutting out and the pilot saying: "Brace up, we are going to clip some trees". Pilot Paul Norman, 52, from Salisbury, a chief scientist with the Defence, Science and Technology Laboratory at Porton Down, Wiltshire, died from multiple injuries. Flight jumpmaster Richard Smith, 42, and his daughter Claire, 17, died from a head injury and multiple injuries respectively. The AAIB report into the crash said there was "no conclusive cause" of engine power loss, but added the parachutists were neither seated nor restrained.